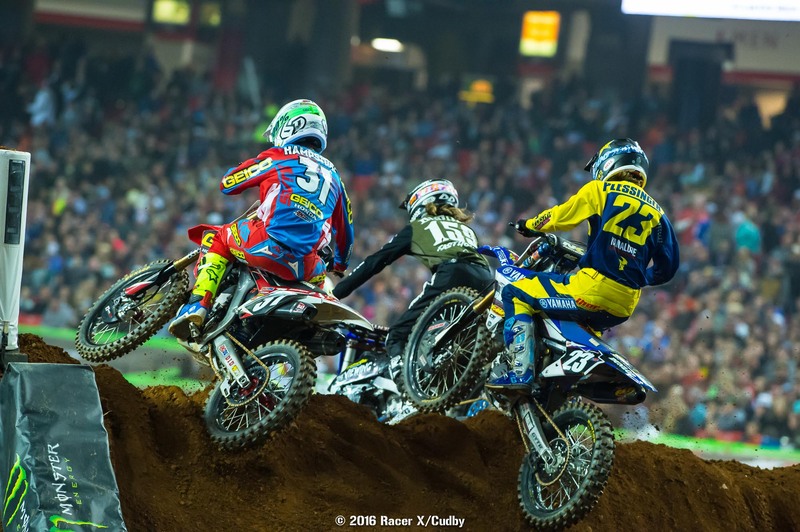 They say history is written by the winners, but at round eight of Monster Energy Supercross at the Georgia Dome in Atlanta, Georgia, the riders who didn't win had the more interesting stories to tell. 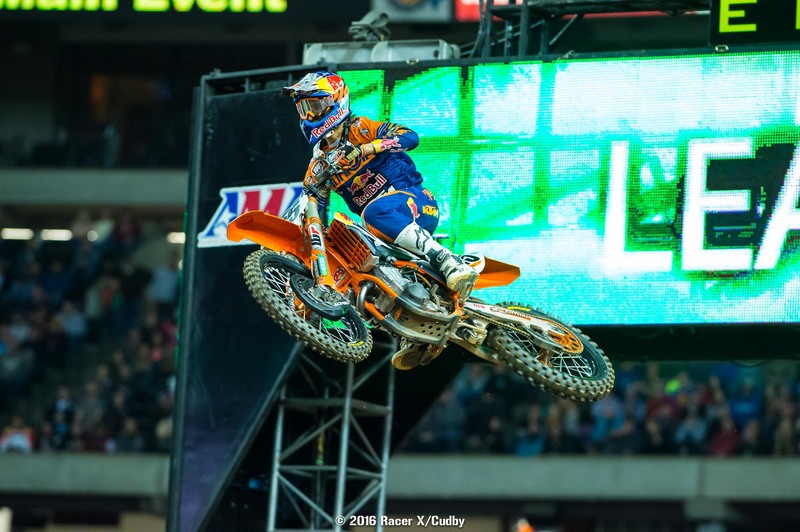 That's especially true for Red Bull KTM's Marvin Musquin, who came within one lap of a glorious first-ever 450SX win over his teammate Ryan Dungey. In the 250s, Martin Davalos and Malcolm Stewart looked like they were going to hook it up in a battle for the win, before Stewart clipped a downed rider--and ironically, Malcolm's brother James had a hand in Musquin's brutal defeat when he slowed Musquin while going a lap down. In all, Dungey and Davalos emerged the winners, but it's Marvin and Mookie who were left wondering what could have been. Justin Brayton and Marvin Musquin battled for the lead through the first turn before Red Bull KTM's Musquin secured it, Chad Reed and Jason Anderson came in right behind them. 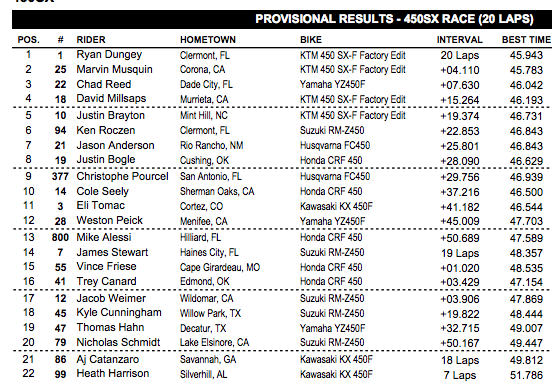 But soon Ryan Dungey was going nuts, blowing past Anderson, Reed and Brayton within two laps. Reed, on the Monster Energy/360Fly Yamaha, then distanced himself from Brayton, and then Anderson and Eli Tomac collided and Tomac went down, sending him to the back. While there, he saw last week's winner Ken Roczen, who started in about 15th. Rockstar Husqvarna's Anderson then tried to put a charge on Brayton for fourth but made a bobble. This put Anderson in the sights of Honda HRC's Cole Seely, who pulled a slick move on the wall jump to get past. Seely wanted to protect his inside in the next corner to prevent Anderson from getting him back, so he basically stopped his Honda in the corner that hooks onto the start straight. Anderson got on the brakes but was too late, and they hit each other and both went down. This let Davi Millsaps by for fourth, and then Seely got up before Anderson. Anderson was then locked into a fight with Justin Bogle, Weston Peick and Tomac. But it wasn't over, because on the last lap Anderson and Seely hooked up again, and Anderson knocked Seely down. After several close calls battling through the years, things finally boiled over with those two. 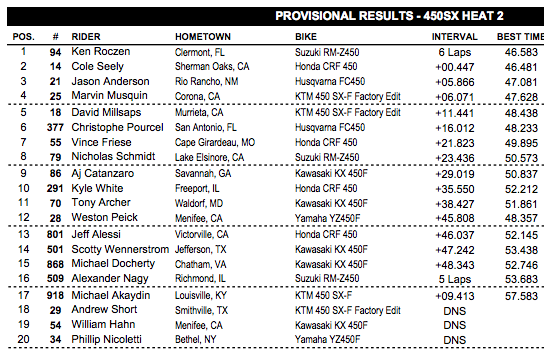 Musquin ran a fantastic first half of the race, maintaining a gap over Dungey. But by lap 10 Dungey started to roll and close the gap, and the duel between the teammates and training partners was on. 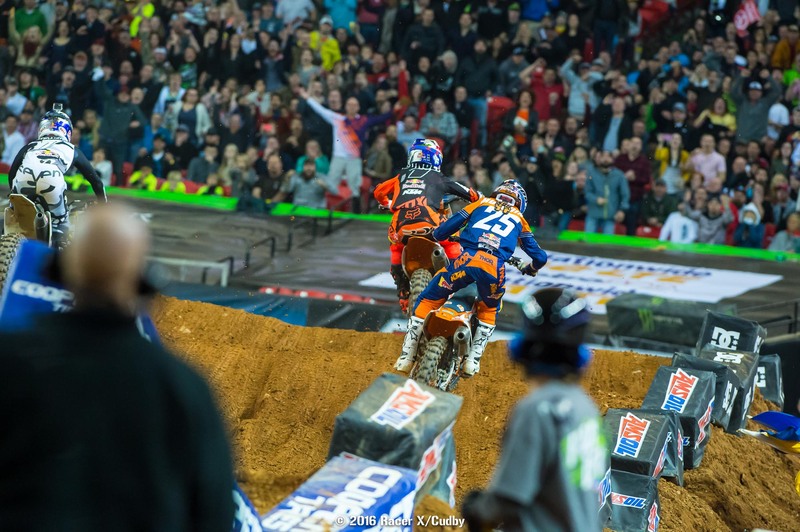 The Georgia Dome crowd started to get loud in anticipation of a Dungey move, but Musquin proved a worthy challenger. Marvin rode fantastic, running totally different lines than Dungey and making it work. Dungey finally showed a wheel on lap 17, but Musquin stuck to his lines and held on. Finally with a lap and a half left, things were getting loud, tense and crazy as they started to weave through lapped traffic. Then the white flag came out. 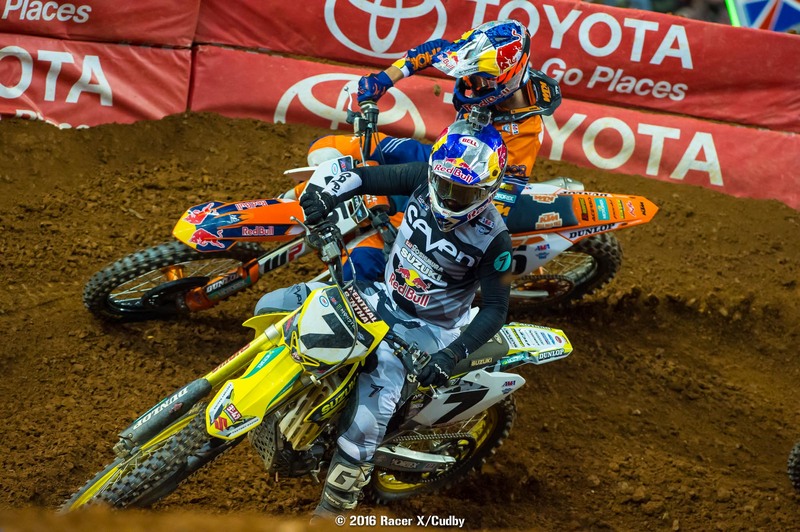 Of all people, they approached James Stewart, who was just circulating trying to complete his laps…and he was right in Musquin’s line. Marvin still tried clearing a jump but came up short, and when he clipped he bounced sideways, nearly crashed and went off the track. Dungey leaped past him to take the lead and the win. Just like that, Musquin’s brilliant performance was erased, and Dungey had himself another win. Reed had a nice rebound from a few off weeks to salvage third. Millsaps, despite a sore thumb and a cold, logged his best finish of the year in fourth, ahead of his BTOSports.com KTM teammate Brayton. Roczen ended his race-long charge in sixth, ahead of Anderson. GEICO Honda's Justin Bogle had his best race of his young 450 career with eighth, ahead of Christophe Pourcel and Seely. 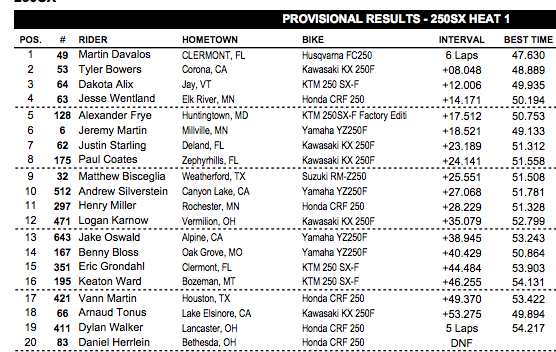 Millsaps passed Brayton for fourth, Roczen came from way back to sixth. 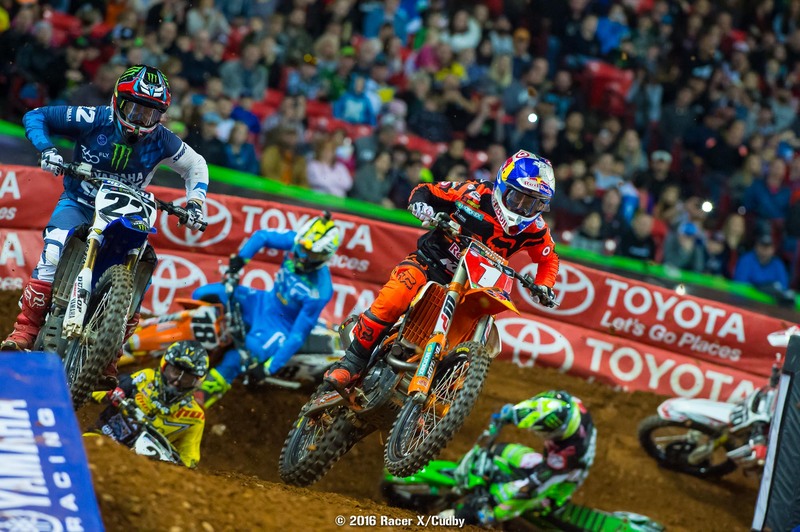 It was the best of times and the worst to times for Troy Lee Desigsn/GoPro KTM's Shane McElrath, who grabbed the early lead when 250SX East blasted off for its season opener. He led through two turns and then crashed over a berm, sending him to last. 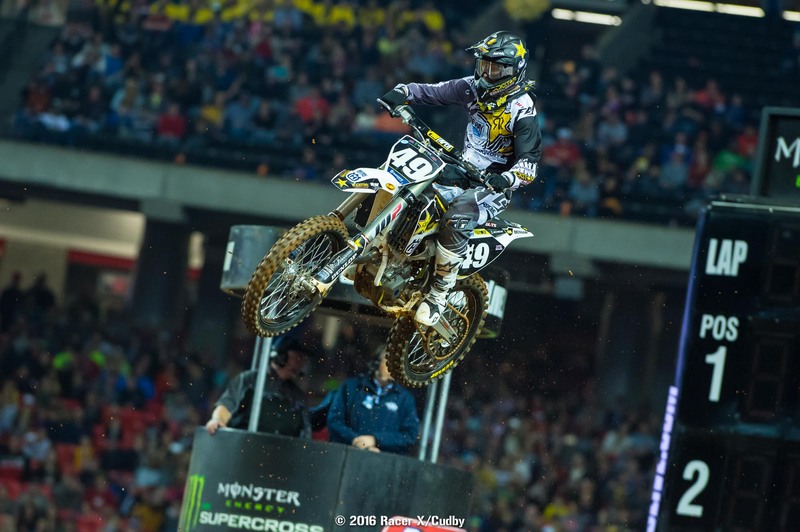 Martin Davalos quickly put his Rockstar Energy Racing Husqvarna into the lead ahead of Darryn Durham, with Malcolm Stewart, who had been logging the fastest times all day, third. 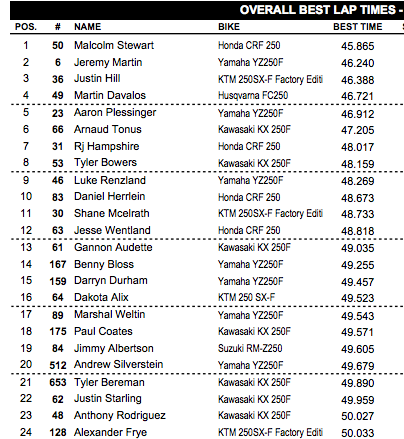 GEICO Honda's Stewart took over second and set after Davalos, slowly inching up on the leader. Meanwhile, Monster Energy/Pro Circuit Kawasaki's Tyler Bowers sliced into third, but was under fire from Aaron Plessinger. Just as a Davalos/Stewart battle was about to get good, the leaders headed to the sand section, where McElrath was down again with a second crash. McElrath couldn't get his bike going, and Davalos avoided him, but then Stewart clipped him and went down. This gave Davalos plenty of breathing room, and he managed the race from there. Stewart dug deep and made up a lot of ground in the closing laps, but he ran out of time. 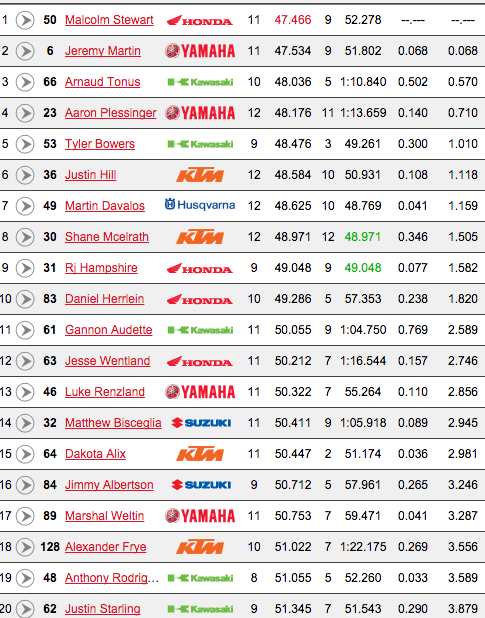 Davalos strikes first in the east, with Stewart second. On lap six, Plessinger nearly went down trying to get past Bowers, then recovered and made the pass for the podium. His Yamalube/Star Racing Yamaha teammate Jeremy Martin was close behind and also got Bowers, but Plessinger was able to distance himself from his teammate and secure third. Late in the race, Justin Hill was on a huge charge, passing RJ Hampshire and Bowers to get into fifth, and then closing all the way to Martin's rear wheel on the final lap. He ran out of time, and the top five was set. 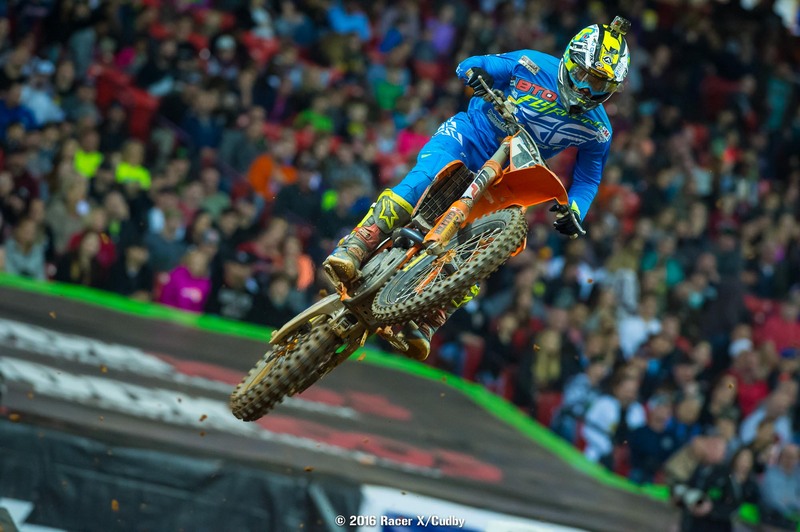 Davalos won his first-ever SX here in the Georgia Dome in 2014. 450 Semi 2: Davi Millsaps grabbed the holeshot in this one but took on heavy pressure from Trey Canard early. But Millsaps stepped it up, he and Canard handling the big triple-triple before the dragon’s back with ease. They pulled away from James Stewart, who looked to be just trying to ride safely. Justin Bogle actually pulled up on Stewart on the final lap in a fight for third, just ahead of a huge battle for the final transfer between Vince Friese and Jake Weimer. Millsaps hung on to win, while Weimer bumped Friese in the final corner to try to get the spot—he ended up crashing, and Friese got the position. 450 Semi 1: Mike Alessi is still a holeshot machine! He holeshot his heat, he holeshot his semi. This time he held on to win it. Christophe Pourcel and Weston Peick ran second in third but late in race, Pourcel tagged a tough block and went down. This moved Peick to second, Tommy Hahn to third and Nick Schmidt to fourth. Pourcel clung to the final transfer, just ahead of Kyle Cunningham, who has now jumped up to a 450 for the MotorcycleSuperstore.com Suzuki team. 250 LCQ: After two big crashes in his heat, Tonus really needed to bounce back in this LCQ. He did, starting second and getting around Jimmy Albertson to win it. Albertson crashed in his heat while running fourth and is riding with a broken foot—but considering all that he’s riding well. Benny Bloss, your Horizon Award winner from Loretta’s last summer, took third to make his first main. Anthony Rodriguez took the final spot in the main on his new Traders Kawasaki ride, Tyler Beremen was just short. 450 Heat 2: Ken Roczen pulled a huge holie in this one, but Cole Seely got inside in turn one to get close to him. Those two put on quite a show, with Seely showing speed in some sections and even pulling up side-by-side with Kenny, only for Roczen to hold each pass attempt at bay. It even went down to the final corner, with Seely cutting inside and showing Kenny a wheel. But Roczen held on for the win. 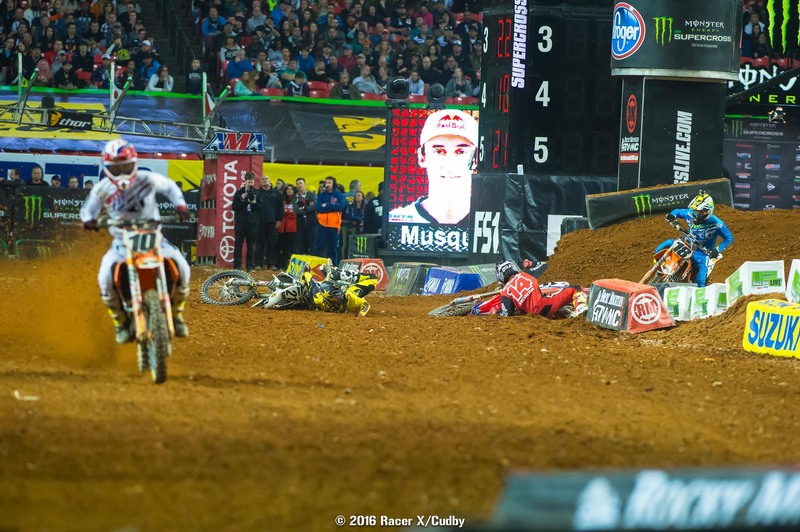 Right behind them came the same situation, as Jason Anderson had moved around Davi Millsaps and Marvin Musquin, but Musquin cut inside in the final corner and almost got him. Anderson hung on for third. Roczen got his heat race last week and said that was a big boost going into the main. Will it work again? This one also featured a huge crash on the first lap with Andrew Short, Wil Hahn and Phil Nicoletti. It was ugly--we hope they're able to return for the semis. It looked like Short drifted into Nicoletti's line, sending them both to the ground, and then Hahn got caught in the mess. 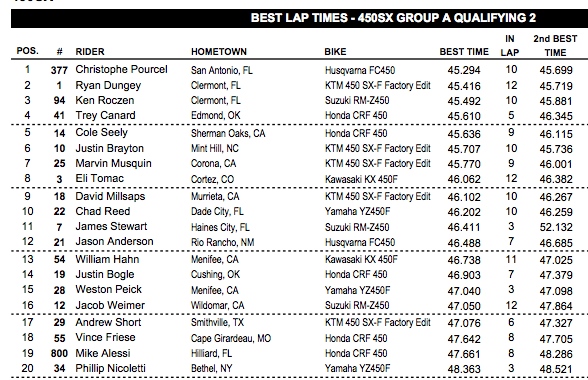 Tomac with the fastest time in a stacked heat. 450 Heat 1: Mike Alessi’s starts are absolutely back! He grabbed the holeshot in this one over Brayton, and Brayton got him for the lead in the whoops. 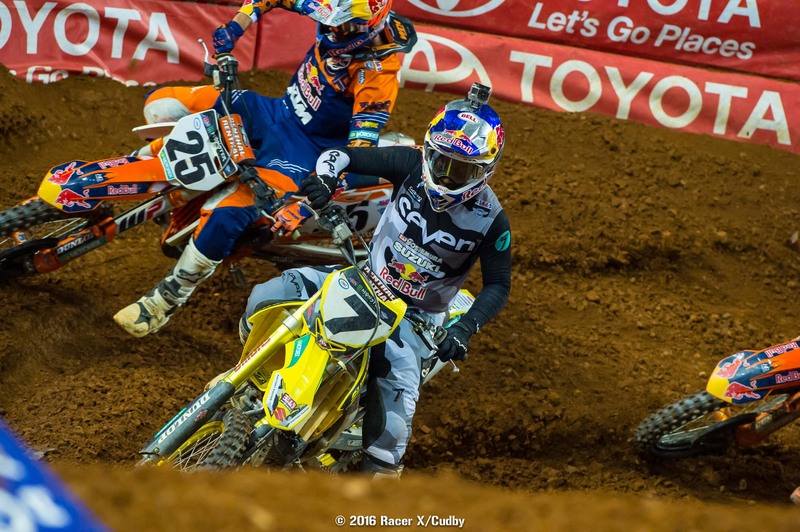 Moments later the returning James Stewart leaped past Alessi, and the crowd went crazy. Then came a snarling #deepfield pack, with Eli Tomac, Ryan Dungey, Chad Reed and Trey Canard. 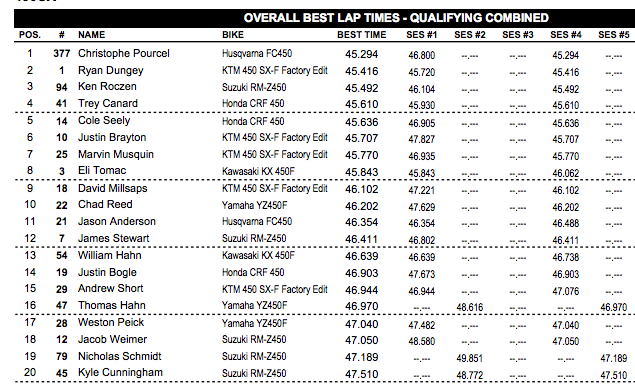 Canard might have been the fastest of the group, passing Reed and then Dungey with a wild move. A few laps later, Stewart tucked the front end in the sand turn and went down, Canard tried to adjust his line to miss him and crashed, too. This let Tomac and Dungey slide past, but meanwhile Brayton was already gone. 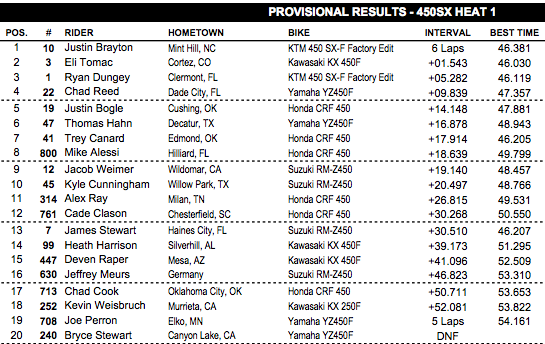 Stacked heat but the BTOSports.com KTM man comes out on top. 250 Heat 2: When the gate dropped for this heat, it actually didn’t. A few gates didn’t go down—although it looked like a few riders might have just jumped early and ran into it. Either way, the race was red flagged and poor Josh Bartosh, who was leading, was sent back to try it again with the rest of the riders. On the second start, Malcolm Stewart, who was one of the riders stuck in the gate the first time, got the early lead. He absolutely checked out from there, winning it by about 10 seconds. Shane McElrath rode to a solid second. And poor Josh Bartosh started fourth, crashed in the whoops, and then crashed again before finishing last. Better luck in the LCQ! 250 heat two. Stewart was also fastest in both practices. 250 Heat 1: Martin Davalos never forgets how to win heat races. The Rockstar Energy Husqvarna rider led heat one into turn one but Dakota Alix, now a KTM privateer after a two-year run with the old Orange Brigade KTM team, busted through to grab the lead. Davlos got him back in the whoops and took off for the win, the first shot fired in this 250SX East Championship. Tyler Bowers rode up to second but lost some ground to Davalos in the end. Other contenders got bad starts. Jeremy Martin had to come through traffic for sixth. Arnaud Tonus was 18thearly and wasn’t putting in a charge—he ended up finishing in 18th, actually, and will have to go to the LCQ. That’s a troubling development for the rider who missed most of last year with an illness. Davalos led Bowers in a battle of "Guys who has Epstein-Barr last year." This Atlanta track is breaking down in ways we haven't seen in tracks on the west, and it's cool to see the difference. Riders have to smart, and line choice will be key. In the final session, Christophe Pourcel showed he knows how to pick those lines, taking the fastest time in the session, which also became the fastest time overall. Ryan Dungey was second fastest, but, like last week, he never used that insideline/get to the transponder/roll the finish line technique. When the races begin, Dungey will be fast as usual. These are the times in the second practice. We already knew 250SX East would be hard to predict--and timed practice isn't making it any easier, as literally seven different riders all showed great speed and potential for tonight. You could watch Malcolm Stewart, Justin Hill, Tyler Bowers, Martin Davalos, Arnaud Tonus, Aaron Plessinger and Jeremy Martin do a lap and say "Yep, there's your winner." If anyone has the slight edge it would have to be Stewart, who ended up with the top time in both sessions. But beware, this track is going to change a lot with the soft dirt and ruts. It's actually strange to see the riders hitting the corners so slowly, hugging the inside and getting into a rut. Compared to tracks in the West Region, where riders are just sliding around the berms, it's a dramatic difference. Also, for the second week in a row, the field realized they can take a shortcut by cutting inside in the last turn and getting to the transponder feed quickly. This also prevents them from jumping the finishline jump. So, no one will be using that line in the actual race. Seriously, though, from what we saw, maybe give Mookie a slight edge if you're picking a favorite. But there are at least seven riders who look like legit shots to win. 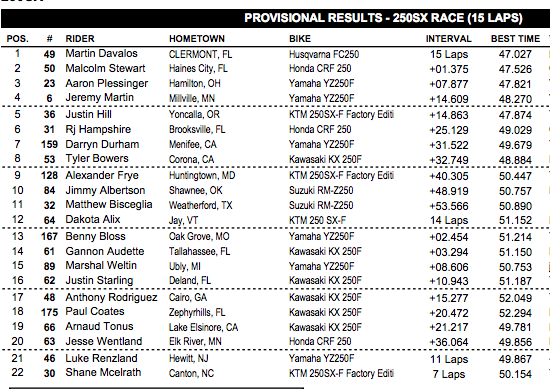 250 times from the second session. Overall combined times. It's early, but this marks Malcolm as the man to beat so far. The first practice every Saturday morning doesn't count for qualifying time, but the clocks are running, and Trey Canard logged the fastest time. In session two--which does count--Trey again jumped to the top of the board. He looked fast as usual. There's a big set of leaps some of the 450 guys can do, going triple-triple out of a turn. It's a massive time saver but requires the riders to go way wide in the 180 corner before it--the preferred line for the corner is to stay low in the berm. We'll see if the triple-triple actually gets used in the races. Right after it comes a tricky dragon's back which launches the riders into the sand. That section is getting super rough and rutted. As the ruts began to form the times actually got faster. Eli Tomac logged a flyer to jump ahead of Canard's time, then Ryan Dungey, as usual, was a machine, and jumped to the top spot near the end of the session. Dungey, Tomac and Canard ended up as top three. 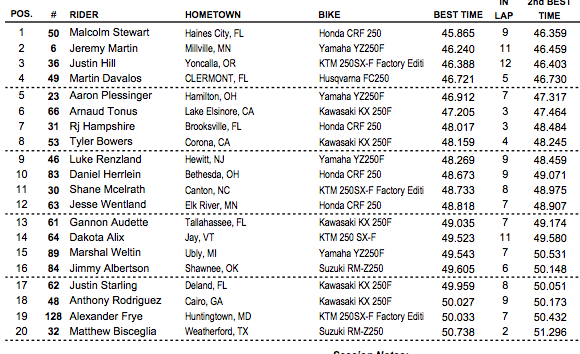 James Stewart looked pretty steady in his return, putting his #7 into the top five fastest times at one point. He ended the session eighth. When the clocks started for 250SX East, it was Aaron Plessinger ripping of the first fast laps and putting his #23 to the top of the board. He was soon in a slug fest for top time with Malcolm Stewart--those two were ready to roll as soon as they hit the track. Meanwhile Arnaud Tonus got kicked in the whoops and went flying over a berm and down. Then he got up and logged a time that put him on top of the qualifying board! Stewart then put in another heater to get the top time back. 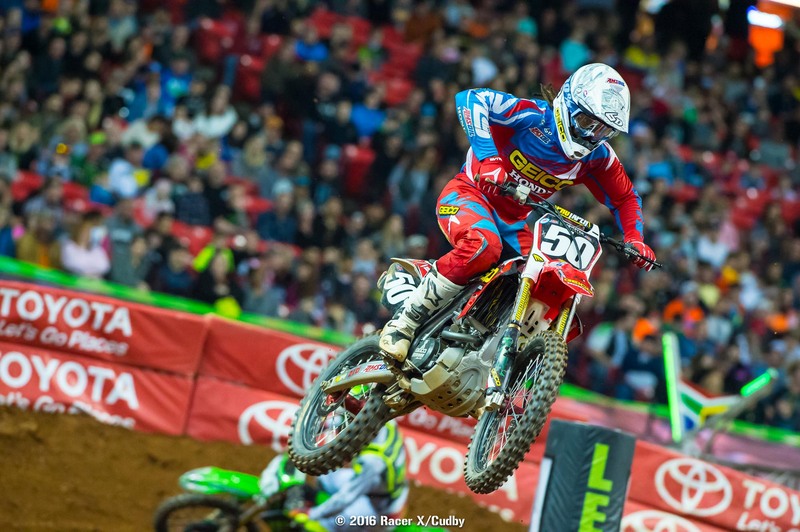 As the session wore on, Jeremy Martin started to find his groove. He wasn't smooth as glass like Tonus or Malcolm, and it looked like he was riding five times harder than everyone else. The two-time 250MX Champion ended up putting his #6 Yamaha into second on the chart. Based on that session, Stewart, Tonus, Plessinger and Martin are going to be bad dudes tonight. But this field is pretty even, don't be surprised to see, well, a surprise in the final session, or in the night show. 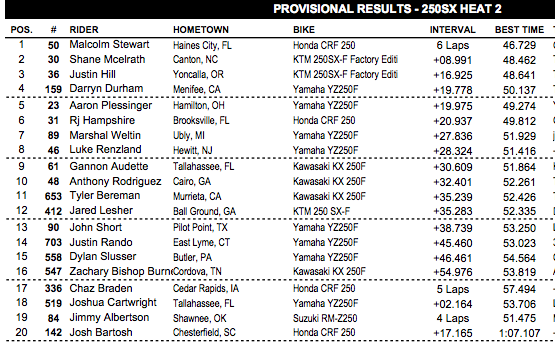 The biggest news is the kickoff for the 250SX Eastern Region Championship, which is a tough one to predict. If you want some scoops, we've posted videos this week with contenders like Malcolm Stewart, RJ Hampshire, Jeremy Martin and Tyler Bowers. We talked to Martin's coach Johnny O'Mara this morning and O'Mara says the difference in JMart's riding style this year will be plain for all to see--and he thinks there will be major, major improvements compared to Jeremy's previous supercross seasons. We also checked in with Justin Hill, who had a disappointing 2015 campaign in the West Region. Hill says to just write last year off, he was hurt and not prepared most of the time. Today, he said he feels surprisingly relaxed and pressure free. He thinks that could translate into something good tonight. 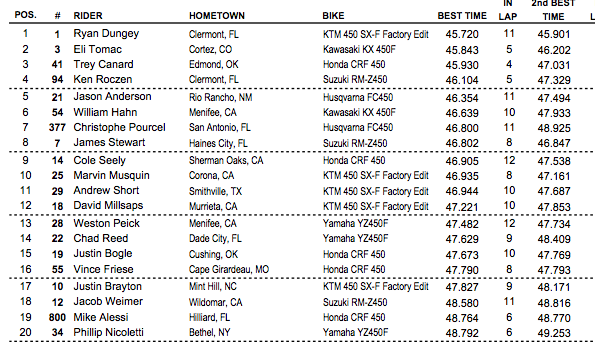 Once the 250 riders hit the track in untimed practice, some of the big boys stood out. Malcolm Stewart and Tyler Bowers looked strong and smooth. But the session is not timed, we'll have practice data coming later this afternoon. In the 450SX class, James Stewart is back after missing most of the races this year with a concussion suffered at Anaheim 1. When we checked in with James two weeks ago, when he was just getting back on a bike, he said he wouldn't return to racing until he was really ready to do twenty laps, and would not pull an Oakland (where he went seven laps before pulling out of the race.) We'll see how it goes for James tonight. The track here is very simple, possibly because it's the opener for the 250SX East. Two whoop sections, but they're simple. There is a cool dragon back into a sand turn section, but by the end of the night we suspect most riders will know exactly what to do with it.